Chesapeake Electric electricians install recessed lighting in & around homes in Annapolis, MD. 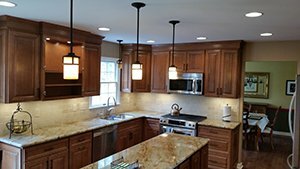 Chesapeake Electric installs recessed lights in kitchens, family rooms, basements, bathrooms, hallways, baths and dining rooms where no wiring currently exists or can rerun new wiring throughout the room. Below is some information regarding Chesapeake Electric recessed lighting services. If you are interested in having recessed lighting installed in your home, contact Chesapeake Electric for in-home appointment and free estimate. Recessed lighting is a ceiling mounted fixture with a circular diameter available in 4-12” sizes. Recessed lighting is housed in the ceiling above the drywall, so all the customer sees is the trim and bulb. This eliminates the possibility of obstructed views and damage to the fixture. Also, it is much more pleasing to the eye. Recessed lighting is one of the most affordable and aesthetically pleasing ways to upgrade or establish lighting in your home. With an array of sizes, trims and functional options, recessed lighting is a sure way to improve to appeal and comfort of your home. Recessed lighting is available in different sizes, trims colors and trim functions sure to meet any lighting requirements in your home. Recessed lighting is constructed with very few components, leaving a small margin for failure within the light: leading to a longer life expectancy. Unlike many other lighting options, you can install a plethora of recessed lights in one area without sacrificing or overpowering any features of the room. Recessed lighting can be install for many different applications such as, architecture or portrait illumination and general lighting. Recessed lighting requires a flood type bulb which distributes even light coverage over a large amount of space, leaving no shadows between recessed lights. Looking to illuminate your family photo, your favorite piece of art work or the beautiful architecture of your home? This type of application would require a wall washer trim. This particular trim projects light directly onto your wall and distributes light evenly. This effect will maximize the appeal and highlight to beauty of any given wall space. You can also add a dimmers adjust the light depending on the natural light coming into your home. Recessed lighting works great as general room lighting for your kitchen, living room, bedroom and dining areas. When installed correctly, recessed lighting can be a hidden part of any room while providing an abundance of light and style. Recessed lighting is a big advantage in areas where illumination is required for detailed tasks. For instance, people who do a lot of food preparation and cooking, find that recessed lighting is a must. A master electrician, such as Ryan, who is skilled in designing lighting plans, can illuminate spots above work areas. Looking to add a look of luxury to your home? In-Cabinet lighting instantly showcases your heirlooms, china, glasses and barware, making your collection look much more dramatic and expensive. Recessed lighting can be installed in virtually any room in the house. Chesapeake Electric will work with you and assist with lighting recommendations such as size, color, spacing and the acquisition of the lighting. Chesapeake Electric can provide the recessed lighting, trims and bulbs to relieve the time and stress from the homeowner. We ensure perfect symmetry of the recess lighting installation using the latest technology available to provide to best product for our customers. Contact Chesapeake Electric for a free recess lighting consultation and free estimate today.